Australia is home to some remarkable scenery and many of its lakes contribute to the glorious landscapes that make it such a beautiful place. The lakes in Australia generally fall into five categories: coastal, natural freshwater, glacial, salt and volcanic. It is this variance that contributes to the diversity of lakes that can be found here. 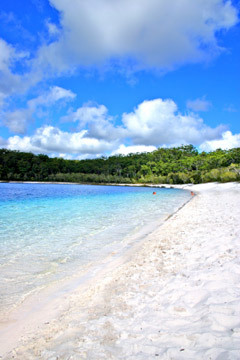 Lake McKenzie is the undeniable highlight of Fraser Island and is notable for its impressive size, its crystal clear water and its surrounding dazzling white sand dunes. Lake Eyre is known as the lowest point in Australia, descending approximately 15 metres below sea level. It is also one of Australia's largest, with the Lake Eyre Basin covering an impressive one sixth of the continent. Lake St Clair is located at the southern end of Tasmania's glorious Cradle Mountain, and is part of the Tasmania Wilderness World Heritage Area. It is also the starting point of the Overland Track, a magnificent 6-day walk that offers unsurpassed views of this spectacular lake. Positioned in the centre of our nation's capital, Canberra Lake Burley Griffin is an entirely man-made lake that is the centrepiece of this political city. The lake is popular with recreational users, who frequent the lake to row, fish and sail. Located within the country's most popular skiing destination, Lake Jindabyne is not only beautiful, but also well stocked with Atlantic Salmon, Brook Trout and Rainbow Trout. Lake Somerset is a popular Queensland destination, especially for fishermen. The lake was formed from the Dam of the same name and is a great camping spot. Located in the beautiful Mount Gambier region of South Australia, Blue Lake looks exactly like its name suggests; a striking cobalt blue colour that will mesmerize and enchant. Lake Pedder is considered the largest fresh-water lake in Australia and is situated in the south-west of Tasmania. This lake truly is the jewel of the wilderness, with its white sandy bays and clear blue waters offering a pleasant setting that never fails to please. This gorgeous system of lakes is perhaps the most exclusive in Australia, covering a distance of an impressive 60 kilometres. The lakes include the likes of Lake Wellington, Lake Victoria and Lake King, which all culminate at the attractive town of Lakes Entrance. Although Lake Argyle was artificially made, its presence in the harsh Kimberley region is surprisingly natural. This vast freshwater lake is nestled among rugged landscapes of magnificent scenery, making it a must-see while in the Kimberley region. Another country that is known for its scenic lakes is New Zealand. Discover the beauty of these lakes on a campervan hire Queenstown vacation.